"The Face of the Person Who is Homeless"
its prevention, identification, and short and long-term treatment. Discuss clinical and/or programmatic initiatives to foster health care equity for the person who are homeless. The McGinley-Rice Symposium on Justice for Vulnerable Populations is a unique scholarly forum for nurses and other health care professionals to address issues of social justice in health care. 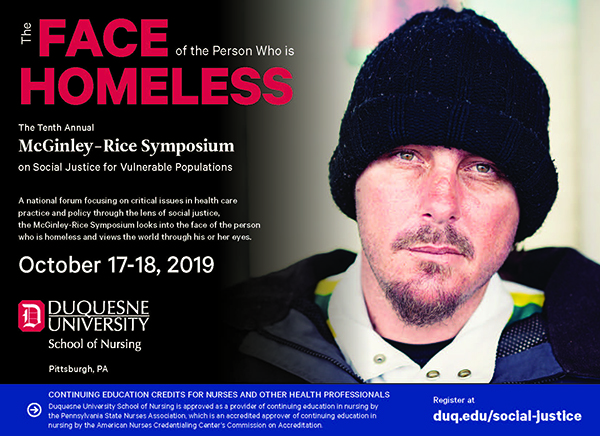 Organized annually by the holder of the Jacques Laval Endowed Chair in Justice for Vulnerable Populations at the Duquesne University School of Nursing, the McGinley-Rice Symposium is an expression of the mission of the Congregation of the Holy Spirit, the Catholic missionary order that founded Duquesne and assists needy and marginalized persons throughout the world.